What can be more annoying than unmanageable hair? Flaky, itchy and dandruff infested scalp! With the onset of winters comes the problem of dandruff. The problem becomes even more bothersome if you have a dry scalp. While the reasons for dandruff infestation could be any but to treat it from the root, it is important to keep your scalp hydrated, nourished and moisturized. And what better way to combat the problem of dry and dandruff infected scalp than regular application of coconut oil. But before knowing the answer to the question, is coconut oil good for dandruff? Let us first look at the causes that can lead to the problem of dandruff. Is Coconut Oil Good For Dandruff? For the magic fruit that the coconut is, it has been a go-to and time-tested remedy for any hair related condition or issue. Enriched with vitamins (E & K), proteins, antimicrobial properties and essential fatty acids; coconut oil easily penetrates the hair shaft and nourishes the scalp from deep within to keep problems of dandruff and dry scalp at bay. It’s penetrative qualities also aids in keeping excess sebum build-up under control and provide the follicles with the much-required strength. 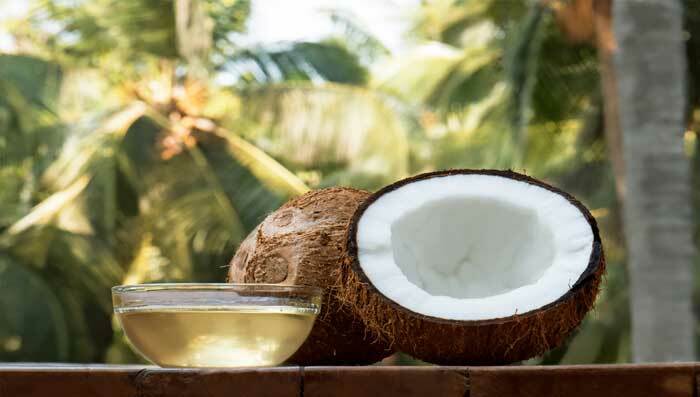 Coconut oil for dandruff is also considered to be an ideal solution because it is known to stimulate the scalp and encourage the growth of thick, problem-free and well-conditioned hair. Yes, you love your tresses. Yes, you need a solution or a cure that will keep them nourished and beautiful at all times. But if you think, using chemically treated products and other tools will help you achieve that then you are mistaken. You might get temporary respite from the immediate problem at hand but in the long run what you get is damaged, dry and dull hair. To avoid this, we recommend to rely on herbal or natural home remedies. Why? Because they do not cause any side-effects, are inexpensive, nourish your scalp from within and can be prepared in not time—sparing you from spending long hours at a hair salon. Neem has excellent antifungal, antimicrobial and anti-inflammatory properties that works well in combating the problem of dandruff or any other scalp related infection. Is coconut oil for dandruff a good idea? We say! Especially when applied on the scalp and hair in combination with lemon juice. Lemon is acidic in nature and so works as an excellent cleansing agent. It helps get rid of harmful toxins and excess of oil from the surface of the scalp thereby keeping the scalp nourished and problem free for long. Honey has natural moisturizing properties that helps in restoration and maintenance of the scalp’s pH balance. Owing to its antimicrobial properties, honey also aids in treating dandruff from the root. It is one of the best dandruff home remedies which is coconut oil based as both baking soda and lemon are revered for their anti-bacterial and cleansing properties. With their regular application on the scalp, you can get rid of not just impurities but also control the production of excess oil, which is also one of the most common causes of dandruff infestation. Bananas are rich in vitamin B that help in nourishing the scalp and add natural shine to the hair. With apple cider vinegar added to the mix, you are sure to get strong and dandruff free tresses.